1 big thing: Shopping for an A.G.
President Trump, in one of his hallmark rituals, recently called a longtime political associate and asked out of the blue: "What would happen if I fired Sessions?" Trump has been openly undermining Attorney General Jeff Sessions, yesterday tweeting that he's "beleaguered." Already this morning, POTUS tweeted that Sessions has "taken a VERY weak position on Hillary Clinton crimes." Reflecting the conversations going on inside Trumpworld, the political associate says he replied: "If you're going to fire people at Justice, don't you want to save that bullet for Mueller?" The WashPost adds Sen. Ted Cruz as a possibility. "Another scenario is that Trump could make a recess appointment, said Steve Vladeck, a professor at the University of Texas School of Law. ... Trump could choose an attorney general during the August recess who would serve until the end of the next Senate session, which would run to Jan. 3, 2019. That person would have the same authority as someone who is confirmed by the Senate." Another Post story builds on Jonathan Swan's reporting on Sunday: Incoming White House communications director "Anthony Scaramucci ... is exercising a broad mandate from the president and intends to follow through on threats to purge aides he believes are disloyal to Trump and leaking to the press." Be smart: This chaotic White House is about to get even more unstable. Insiders expect big changes between now and September. "The clash between internationalists ... and advocates of an 'America First' approach has worn down foreign policy and intelligence professionals inside the government." "Secretary of State Rex Tillerson has told friends he will be lucky to last a year in his job, according to a friend, while two officials said national security adviser H.R. McMaster was frustrated by what he sees as disorganization and indiscipline on key policy issues inside the White House." Not a good sign: "R.C. Hammond, Tillerson's spokesman, denied Tillerson was considering leaving." "Senior national security officials said McMaster was dismayed that his recommendations, backed by his senior director for Russia, Fiona Hill, about taking a tough stance with ... Putin, had been ignored." 3. "I have nothing to hide"
"Donald Trump had a better message and ran a smarter campaign, and that is why he won. Suggesting otherwise ridicules those who voted for him. .. Thank you very much, and I look forward to taking questions from the House committee tomorrow. Thank you." Anchor Lawrence O'Donnell (with backdrop "JARED'S ASSISTANT DID IT"): "Kushner's assistant [said to have prematurely filed his security-clearance form] may become the Rosemary Woods of this investigation" — invoking the Richard Nixon secretary who claimed she could have accidentally caused the 18½-minute gap in a Watergate tape. Jeremy Bash, former chief counsel to the House Intelligence Committee, told Brian Williams: "I think ultimately, both [intelligence] committees are going to ask him to testify publicly. ... [T]hey're gonna want to be able to question him on the record, under oath, in front of the cameras." Be smart: Although Kushner made the most of a difficult day, it doesn't change the bigger picture for the White House. Message: The "Better Deal" plan released yesterday includes an effort to curtail corporate monopolies. Why it matters: This might be an area in which Democrats and the nationalist wing of Trump's White House see eye to eye, and stand in opposition to GOP orthodoxy. That sort of alliance would send shivers from Wall Street to Silicon Valley. What Democrats want: A complete shakeup of antitrust enforcement. What's next? Likely nothing too substantive in the short-term, particularly given that Democrats aren't in a great position to insist on hearings or oversight investigations. But the AT&T-Time Warner deal could prove a political flashpoint. If regulators let it go through, then Democrats can use it as a potent campaign prop. See all the fact sheets on the House and Senate Democrats' "A Better Deal." 5. 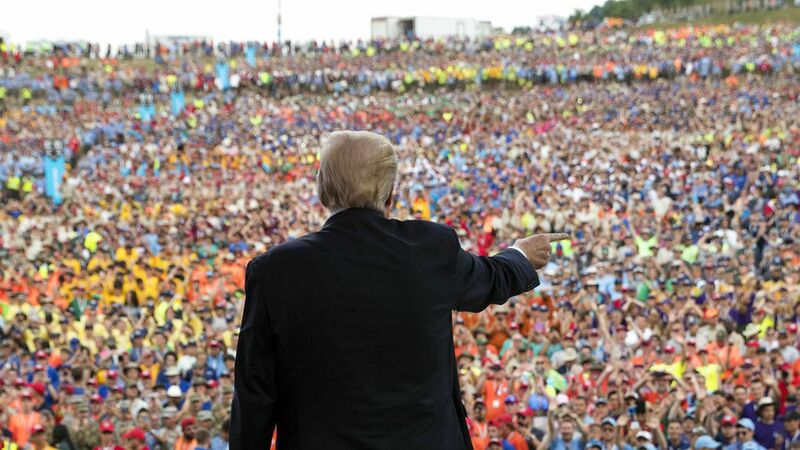 Trump to Boy Scouts: "They're fake polls"
President Trump, speaking last evening to the National Scout Jamboree in Glen Jean, W.Va., began by saying: "Tonight, we put aside all of the policy fights in Washington, D.C. — you've been hearing about with the fake news and all of that. (Applause.) ... I said, who the hell wants to speak about politics when I'm in front of the Boy Scouts? Right? (Applause.)" HHS "Secretary Tom Price is ... here. ... And hopefully, he's going to get the votes tomorrow to start our path toward killing this horrible thing known as Obamacare that's really hurting us, folks." "By the way, just a question: Did President Obama ever come to a jamboree?" "[Y]ou know we have a tremendous disadvantage in the Electoral College — popular vote is much easier. ... We won and won. ... Michigan came in. And we worked hard there. My opponent didn't work hard there because she was told — [AUDIENCE: Booo!] — she was told she was going to win Michigan." "The polls — that's also fake news. They're fake polls." "And by the way, under the Trump administration, you'll be saying 'Merry Christmas' again when you go shopping. Believe me. Merry Christmas! (Applause.)" 6. "The more they move, the more profit"
"[S]mugglers have found a durable business model carrying large groups — often in big rigs — through an elaborate network of foot guides, safe house operators and drivers." "A criminal complaint about Sunday's discovery ... opens a window on their degree of sophistication and organizational muscle: passengers had color-coded tape to split into smaller groups; and six black SUVs awaited them at one transit point to bring them to their destinations." "Big rigs emerged as a popular smuggling method in the early 1990s amid a surge in U.S. border enforcement ... Before that, people paid small fees to mom-and-pop operators." "The growing use of trucks coincided with increased trade with Mexico under the North American Free Trade Agreement, allowing smugglers to more easily blend in with cargo." Axios' Sara Fischer: Flipboard is becoming one of the biggest drivers of traffic to news stories on mobile, according to media analytics firm Parse.ly, which found that Flipboard's traffic has been growing steadily, while digital magazine competitors like Pocket and Feedly have plateaued or gone into decline. 8. NYT's "complex and nuanced shift"
Joe Pompeo, now of Vanity Fair, writes on The Hive: "The first six months of the Trump administration have been one of the most glorious eras in the history of The New York Times. The paper, in addition to its rival The Washington Post, has been at the absolute center of the culture, a bastion of sanity, a daily reminder of why journalism is necessary and why dead-tree media is best equipped to supply it." And yet one editor tells Joe: "The mood at the paper is poisonous in a way I've never seen it in the past 15 years." It's because of a reduction in copy editors as the paper continue reorienting for digital: "A major newsroom reorganization is upending a time-honored method of producing the Times's signature journalism while simultaneously making an entire class of employees feel obsolete." "The streamlined system has been given the somewhat Orwellian-sounding designation of 'strong editing,' in which 'strong editors' will be the chief cooks and bottle-washers." "Additionally, the Times's midtown Manhattan headquarters is itself being upended, shrinking by eight floors and leaving all but the highest of editors without private offices. Open floor plans have long been increasingly popular among publishers, ... but this, too, amounts to a decisive and, for some, painful break with the news organization's past." "[I]ts physical footprint is shrinking from 20 floors to 12." "Despite the dozens of positions that are being eliminated, the paper's headcount of around 1,300 won't change much. The money saved will be used to create 100 new positions for reporters and visual journalists. Investigative reporters will be a priority, according to the Times." "Sinclair's conservative credentials are seen as the reason newly appointed FCC chairman Ajit Pai moved quickly ... to pave the way for the Sinclair-Tribune deal ... that would bring together more than 200 stations that reach some 72% of U.S. TV households in 81 markets, including 39 of the nation's 50 largest markets." "The combined entity would become a broadcast colossus the likes of which the industry has never seen." "Sinclair has generated controversy by mandating all of its stations run [former Trump official Boris] Epshteyn's nine-times-weekly 'Bottom Line With Boris' commentary segments. The former Trump strategist has unfailingly supported his ex-boss in virtually all of his two-minute segments." Why it matters: "The size and scope of Sinclair after absorbing Tribune has accelerated the M&A fever that was already brewing among TV station owners large and small. Everyone ... predicts the local TV landscape will be transformed by a wave of consolidation in the next two to three years." "Girl Scouts from tiny Daisies to teen Ambassadors may earn 23 new badges focused on science, technology, engineering and math." "The effort ... nudges girls to become citizen scientists using the great outdoors as their laboratory. Among the new badges are those that introduce kindergarten and first graders to the world of robots and engineering." "Other new badges focus on race car and aviation design ... Next year, another initiative will allow Girl Scouts to earn 'Cybersecurity' badges."